Director/Writer: Mack Hail / Writer: Jim Mills / Cast: Mack Hail, Jim Mills, Cindy Reed, Henry Weckesser, DeVonn Carral, Alisha Lobato. This strange little film only clocks in at an our and six minutes (on PAL, at least), and was shot in Las Vegas sometime in the early 90s, with no concrete answer. Pre-dating the similar Clint Howard flick by a few years, it tells the oh-so-short story of a suburb plagued by a growing number of missing children. What the detective trying to teach the local kids stranger danger doesn’t know is that the goofy-but-creepy local ice cream vendor is the one behind it. With a Halloweeney beginning that has a trio of kids walking around the leafy ‘burb while the ice cream truck slowly cruises by, you’d be forgiven for high hopes. Meanwhile, the detective asks out the big sister of a kid who we just know is going to cross paths with Mr Ice Cream Man sooner or later. Probably at his upcoming birthday party. Cheapness aside, things don’t look as bad as they might, with writer/director/star Hail doing the best job as the creepy killer, who lures naive kiddies to their doom, selectively ignoring any subtext about what he might be doing to them, even taking a break from his usual schtick to murder a teenage babysitter who mocks him. 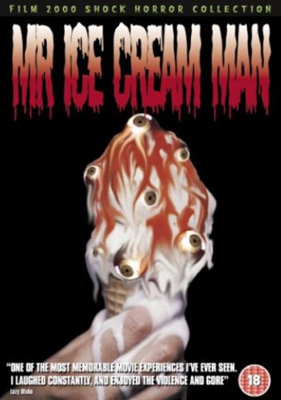 So short that it’s all over before you get too restless, but the killer ice cream dude sub-sub-genre is still untapped for a genuinely good outing. Blurb-of-interest: Hail wrote and directed Switch Killer and was in Carnage Road – which is a contender for worst film ever. tagged with slasher, slasher films that aren't supposed to be funny but are funny, what the hell!? Killjoy uses an ice cream truck, and the absurdly rare Ice Scream and its remake were set in ice cream parlors.